I saw the photo captured by my friend Sulaiman years ago. 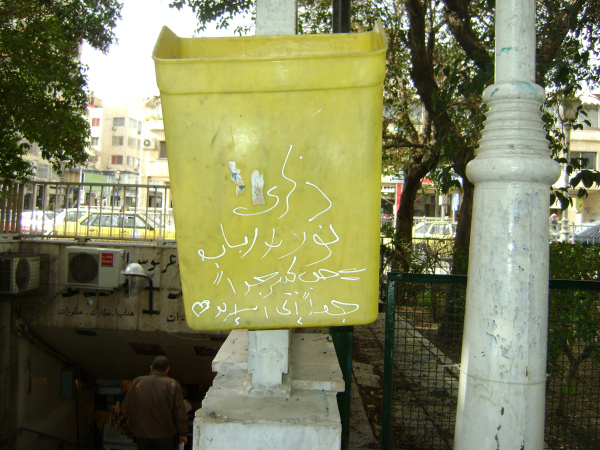 A photo of a waste basket in a corner of one of Damascus parks, a photo which he was hesitant about, and unsure of his feelings towards. Some scribbles written by two teenagers in an attempt to capture a very strong love they thought would remain forever. When I saw that photo, I wasn’t curious as Suleiman had been about what happened to the writers. 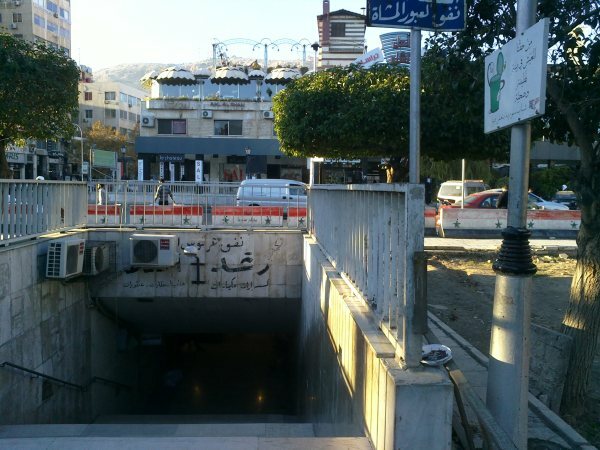 I just remembered Ghada Al Samman’s words: “The most truthful lie is the sentence: ‘I’ll love you forever.’’’ For this reason, there is no difference about the places people choose to write down a remembrance about their love, which they think is eternal. Whether they choose to write it on a waste basket, walls or trees or any public utilities open to this violation. I wasn’t interested in those words written by teenagers (or others) at that time, when it was something of a daily sight. And I won’t be interested in a time where no trees, walls or even their writers remain. But I admired the emotional and civilized idea of lovers’ locks, placed on bridges over the rivers of France, Germany and other European countries. These people engrave their names on the locks. Their love stories stay secret inside the locks, which will witness their love forever. I was horrified when I heard that the councils try to remove the locks and dispose of them, just to make space for new lovers with the dream of keeping their love stories forever. In some countries, people may prefer to keep their love stories on walls, trees or even waste baskets rather than than those civilized lovers’ locks – especially if the councils don’t even think of removing those scribbles . Thinking about this, my curiosity led me to go to that corner in the city where Suleiman took a photo, to see what happened to those scribbles. There, again I repeated the same words: (The most truthful lie is the sentence: I’ll love you forever). I saw that corner in the city, but without any waste basket.